Malayalam television viewers would be experiencing yet another visual treat offered by the glittering stars on earth. Hosted by Asianet, it would be the 16th edition of its film awards being organised to honour the talents behind and in front of the screen who have contributed for the growth of malayalam film industry. Being one of the grandiose show telecast in malayalam television, this event had been organised by Asianet in association with Ujala every year. Being the biggest show in the history of malayalam channels, Asianet Film Awards started in 1998 has millions of viewers from around more than 100 countries who watch the show on TV and also through internet. The 2014 edition of this popular show was held at Dubai at a glittering function held at the Meydan Hotel & Grand Stand on January 10 which was attended by invited guests and celebrities. As of previous years, the 16th edition of this Award show presented annually by the Asianet TV to honour the artistic and technical excellence in Malayalam film industry with over 30 award categories. After successfully held in 2012, two years later this mega show truly gave fulltime entertainment to the people of Dubai. The shimmering galaxy of movie stars was much enough to keep the viewers intact as the ceremony was sparkled with the glamour and charisma of the celebrities. 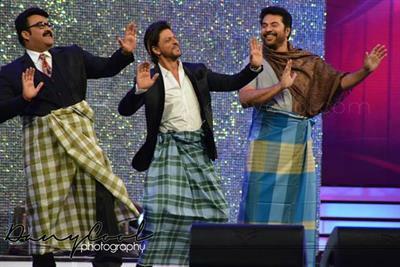 Other than malayalam superstars Mammootty and Mohanlal, Bollywood superstar Shah Rukh Khan and leading Bollywood musician and singer Shankar Mahadevan, grabbed the spotlight with their live performance on stage. A variety of programmes including dance, music and comedy kept the night pleasurable. Along with the celebrities over 200 performers took the stage for their unforgettable music and dance performances. During the function Shah Rukh Khan has been honoured with an International Icon of Indian Cinema award. He was selected by the millions of Asianet viewers with the actor having countless international fans. he much awaited mege show 'Ujala Asianet Film Awards 2014' will be telecast in Asianet on 25th and 26th January from 6.30 PM.